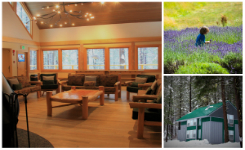 Tierra Retreat Center is nestled into the eastern slopes of the Cascade Mountains. Guests enjoy an expanse of natural surroundings, private facility rentals and a supportive and engaging atmosphere for friends, family and conference gatherings. Take a look - we might be just the place you're looking for. Full Bloom anticipated for Spring Events and Conferences at Tierra.